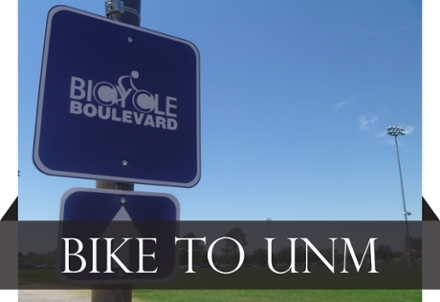 UNM is a Bicycle Friendly University, recently recognized with a Bronze level Bicycle Friendly University (BFU) award from the League of American Bicyclists, joining 100 other visionary colleges and universities from across the county. There are currently 37 BFUs in the country. As a BFU, UNM has access to a variety of free tools and technical assistance from the League to become even more bicycle-friendly. When colleges and universities invest in bicycling, great things happen including a decreased carbon footprint, reduced healthcare costs, community connectedness and a fun and healthy campus culture. To learn more about the free BFU program, please visit the League of American Bicyclists. All ABQ RIDE buses have bicycle racks so you can bike to your bus stop, ride the bus here, and bike where you need to be on campus. We have many free-to-use bike racks on campus. For added security, there are also 94 bike lockers placed throughout Main and North campuses and are available to rent for $48/year. Currently, there is a waiting list for most areas in the bicycle locker program. Contact Parking & Transportation Services at 505-277-1938 or stop by our business office at 2401 Redondo Dr. NE to inquire or get on the waitlist. How Do Bike Lockers Work? Use throughout the year to store your bike, helmet, etc. UNM Rec Services Outdoor & Bike Shop is a complete bicycle repair facility, servicing all bicycle makes and models. Surly Tucker rental bikes are $50/week (not including weekends) or $10/day. Bikes are $70 for a full 7 days and include helmet and U-lock.